In today’s show, we’re discussing 6 things you need to start planning NOW for Easter 2019… PLUS we’re also giving you a free checklist with another 15 things to prepare for (download below). 4:11 – Will you have enough volunteers to cover Easter Sunday? There are plenty of eggs around for Easter, but they don’t need to be scrambled. Start Easter planning NOW to avoid last-minute mistakes. Planning now gives you 10 weeks of time to clean, test, arrange, order, fix, resolve, repair…all of the above! 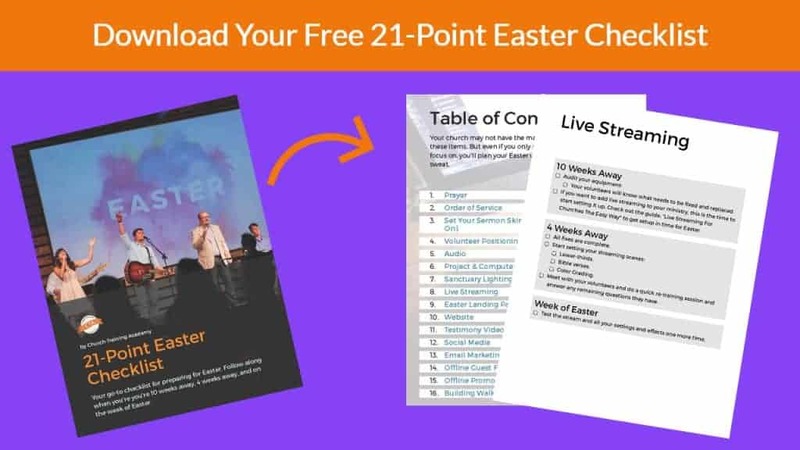 Download the 21-point Easter Planning Checklist (above) and get your church on the right path for a successful Easter. Dave: Easter 2019 is right around the corner and being prepared is the best way your services can come off like gang busters. That is what we’re talking about today. Dave: Hey guys, welcome to another thrill packed episode of the Church Media Guys Show, if we have not met, I’m Dave Curlee. I’m the founder of ChurchTrainingAcademy.com which is a place where you and I and other media minded and ministry minded folks come together to learn how to use and exploit and media and technology so we can take the gospel to the world with me as always is my partner in crime, the guy who fills in every single discrepancy that I have. Justin Nava. Justin: What’s going on guys? What’s going on Dave? Thank you for the fantastic intro. I’m here as always and hope you guys are doing good. Hope you guys are keeping warm because it’s cold in America right now. It’s like 40 degrees in south Texas, which is pretty much Mexico. I don’t know how you guys are doing it. I’m freezing. Dave: Easter is coming up and if you are watching this before Easter 2019 let me tell you, when this comes out, you got 10 weeks and you might be thinking, oh, 10 weeks, perfect. I don’t have to do anything for six more weeks wrong. Okay, let me quote our president again, WRONG!. Okay, we have 10 weeks to get stuff ready and too many times we say, oh, we got plenty of time and then four weeks comes and we start scrambling a little bit. Maybe the music ministry doesn’t know what they’re supposed to be doing. Maybe the kids has prepared something and it hasn’t told the leadership and so no one knows what’s going on until the week before and then you’re struggling to get graphics and stuff on your website. People have already made their Easter plans by then, so you need to beat the thought and the attention of Easter and say, this is what we’re doing. Justin: Make some plans around us. Don’t try to fit us in your schedule plan around what we’re doing. And to do that, you’ve got to start preparing early. So today we’re sharing with you our Easter preparation tips for 10 weeks out because this should go out about 10 weeks before Easter. We have a 21 point checklist that you’ll be able to download link down below that has all of this and more because the show can not be five hours long. We got 21 check points that you need to look at 10 weeks before Easter starts. We’re going to go over five or six of them today. Dave, are you ready? Justin: I am. One of the things that, I don’t know if a lot of people have really thought about. There’s these official numbers and if you take a look at your church and look at the attendance and stuff, it’ll probably bear this out. The average church has three major events or three major sundays throughout the course of a year. Obviously, Christmas is one of the biggest because you know, we have a candle lighting service or we have a Christmas eve mass or something like that. That’s always huge. Okay. Mother’s Day. I didn’t realize it, Mother’s Day, but it makes sense because everybody wants to go and be with mom and honor moms. We’re going to go to church with mom then we’re going to go to the golden buffet or whatever it is with mom afterwards. That makes sense. But Easter is also the third one. Dave: Okay. And I don’t know if it’s Christmas then Easter than Mother’s Day or if it’s Mother’s Day then Easter then Christmas. I don’t know. It doesn’t matter. But we’re talking to the big three here and basically, I’m not going to lie. The list of things that we have here. Like that kind of works for each one of these. We’re focusing on Easter because we are at the time, this drops exactly 10 weeks out from Easter. Okay. So there’s a lot of stuff that you guys need to do that you need to look at that you may not have thought of. And some of it, Justin in our list, am I right? Some of it is like walk around and check the paint in the hallways and make sure there’s not a chip that needs to be, I mean we get down to that kind of of of level as well as some like really big picture stuff as well. Justin: Yeah. So, you’re not, you’re not running cabling right now. You are in the planning stage. This is the Easter preparation stage to get you ready down the road because you want to measure twice cut once, right? You don’t want to just start throwing stuff together. So let me start off with number one. Number one thing I think that you need to start preparing for your Easter service is number one, get volunteer commitments. Okay. it is January 31st the time that we are recording this, I can already tell you my Easter plans as well as most of your families are already thinking about Easter. Men and women in the workplace are already thinking, do I have Good Friday off? And if not, am I taking it off? They already know if they’re traveling, they’re already know if they’re seeing family. Justin: Moms are already planning what their Christmas parties are. Grandmas or planning, what’s, you know, what time and when everyone’s coming to the house, so volunteers know what they’re doing this Easter. So you need to go ahead and figure out how many volunteers am I going to have. There’s nothing worse than walking into a children’s ministry. The one time you go to church a year and they’re short staffed. That’s just awful. That’s terrible. Horrible. And it’s not a great impression. And that might be one of the reasons, one of the reasons they only come once a year. Oh, they’re never staffed. That’s cause you’re always only here on Easter. So go ahead and tell your volunteers, get their commitments. Hey, are you going to be here for Easter? Can you serve on Easter? We got more kids in the children’s ministry. We got a bigger Easter program. We need more people in the booth. We need more greeters, more ushers cause we’re expecting twice as many people get those commitments now. And if they can’t come, you know they’re not going to be there. So there is no question. Okay, so put the word out now to your volunteers. Are you going to be here? Let me know by next Wednesday. Okay. this way you get a commitment from them and you know how to plan for your resources and your budget and how many people in bodies you need out there serving in your church. Dave: Yeah, exactly. Now’s a great time. Good, good, good call there. One of the things, that I think folks need to do is the media team needs to like get a fine tooth comb and go through the sound system. Now’s a good time to do things. Like if you’ve got a direct box that is giving you some grief, you know, you get a little hum coming out of it or something. you know, now’s the time. You got 10 weeks, so now’s a good time to hit a guitar center or something and get that box replaced. Or if you know got somebody that’s a solder demon and knows how to get in there and fix it. And so now’s the time to do it. Trace out the hums, trace out, the broken equipment, the microphones that, you know, that need to need to have a, a capsule replaced, all that kind of stuff. If you’ve got to, you’ve got an amp that’s got a channel that’s, you know, like weak or giving you problems or something. Dave: Or if you’ve got a speaker that is crackling, now’s the time you’ve got 10 weeks before it’s go time to get something ordered and get something replaced, get a bad cable fixed, you know, whatever. Go through it. Now is a great time. If you have not done this in a while, like some churches, maybe not since you set up the sound system originally, go ahead and like re-EQ it, you know you may have more people that then you had when you first set it up and stuff. So go ahead and go through the process of rebalancing the room so that the experience for the people that are coming can not be a distraction but help them come to a point of worship. You know, it, it’s really important. You’ve got time, 10 weeks out, go ahead and start tracing some of these little things that you’ve just kind of been ah, fix it later. Justin: Tip number three, is go ahead and give your website an audit. Okay. Same thing as you’re auditing your, your sound system and looking for those little glitches and fixing all the cables and you know, re-taping the ends. Maybe if they’re falling off or coming loose, give your website and audit and just take a look at from a fresh pair of eyes. Maybe you haven’t looked at it in a while. What’s missing? What’s outdated? What needs to be fixed? Go through all your links. Okay. Make sure all your links, if you have a blog, all your links are still working. Okay. Google does not like bad linking. If it knows there’s a link on your website that goes to a bad place or a place that doesn’t exist, maybe a 404 error. It knows that that’s a bad customer experience and they will down rank you. Justin: Okay? There’s a lot that goes into search engine optimization and getting higher in Google. That’s just one of them. but go ahead and fix that. Same thing. If you have leaders on your page, there’s no telling. I think I’ve told this story before. I went into a church expecting to see one pastor that was listed on the website and we got a totally different pastor, right? So even their senior pastor on their website was outdated. Fix that. Okay. I was very disappointed because I went to expecting to see one guy and I met someone else. so fix that information, you know, go through your children’s ministry page. Are the pictures updated? do you still have photo releases for all the kids, the youth ministry page? Is there anything listed? Maybe it says, oh, we enjoyed camp 2014 and you’re like, oh boy, we haven’t been to that camp in like four years. Justin: Okay, fix that. Okay. Write a new pastor blog post. Last blog post was written back when Obama was president. Update it. So go through your website with a fine tooth comb. Ask a couple of people who have never seen your website before. Hey, what do you think? What questions do you have when you see this website? And then put an FAQ that answers those questions. Go through your website with a fine tooth comb and just fix any issues with it and update it to 2019. Dave: Yeah, that’s a good one. You know, this is something that, this is one of those little subtleties that you hammer a lot is a, you know, you’re talking about making sure that this pastor is actually still there, you know, or the staff member is actually still there. you know, when people are going to be looking at this, it’s going to be the beginning of spring. So it’s probably best to not have the winter pictures up there, go ahead and, and take everybody outside after church one Sunday and shoot them with a little bit of greenery behind them or grab the ones that you did last year, unless the guy had a nose job and he looks drastically different, it’s gonna be okay. Just, just be sure that the seasonal look is the same. It’s not like everybody standing out in a Parka, you know, or standing out where, you know, if it’s still cold, like it is up, up north. You don’t want to have him in there, you know, polos or something like that. So a flannel or something. Justin: One funny story. I had a client, a church client. We did their website. One of the pastors had a picture with his dog as his leadership page and we asked him, I said, we’re going to take new pictures and make them all the same dude. I get a picture with him, his wife, and like a five year old. And I said, I said, I hope this picture with your dog is older than six or seven years old. Not that, oh, I got a family, but here’s the picture of me and my dog. It’s like, it had been that long. Yeah. He started a family since he took his last profile picture for the church age. Dave: So exactly. Well, and if there’s 20 years difference, don’t, don’t put that great picture of you at 42 if you’re 70. Yeah. Justin: This isn’t Christian mingle. This is your leadership. Dave: Yeah, go ahead. Yeah, we like to see the gray, you know, when it comes to, you know, to a scholarly pastor. Okay. That’s okay. Justin: All right. Dave, what do you got now? Dave: I got another one. We’re back in the sanctuary again and it is dealing with your projectors and stuff. I mean, most churches nowadays have at least one projector, What’s going on with the bulb. You know, those bulbs usually have a 2000 hour shelf life, which for us using them for a couple of hours, two or three or four hours a week, you know, could end up being a few years. You might want to get into the menu, depending on the projector, you may be able to get into the menu and have it tell you what the life is on the, on the, on the bulb. If you’ve got an old projector and you don’t have access to that information, see if you can find a receipt about maybe when you bought the bulb or something. So you could sort of backtrack to, you know, well, this is about a four year old bulb and a, yeah, Matt want to go ahead and change it now? Dave: Now’s a good time to do that. Okay, now’s a good time to, make sure that your projector is not going to go out. You know, Friday before Easter and all of a sudden you’ve got two of them up on either side. You don’t want the service to look like this, you know, whether it’s just that one and everybody’s looking over here at that one and that other one is just up there looking all beautiful and bad. You don’t want that. Also check out the registration like the colors you know, you can like get the green and the blue and the red and, and you know, they can be off a little bit. Get in there and kind of calibrate that, tweak that, things like that. Dave: Also, if you’re doing like triple wide or or double, you know where you got two screens that are blended together, get in there and tweak those, recalibrate them and do stuff like that. Now’s a good time to play with that and fix what’s broken when it comes to your projectors. Also, they all have fans in them because they blow out the heat, which means they’re sucking in air, which means they’re sucking in dust, the dead skin cells up after all those hundreds of people sitting in the auditorium every single week. So go ahead and get those filters cleaned out, blow it out, get stuff like that so that, that thing will not give you any issues when it comes time for all those CEO people coming in on a Easter Sunday. Justin: I love it. Anthony, thank you so much for sharing that, we’re going to use that from now on. CEO…if we need to give credit to someone else, let us know. Yeah, especially about the fan. We actually had a $2,000 projector die because we never dusted it. This was a long time ago. and we opened it up and it was just terrible. It was just awful. Just, I mean, I think there was more dust than metal inside of it and a, it totally just overheated and killed it. So if you’re not dusting your projector, now’s a good time. And that was a good time. Justin: Going into my last preparation tip. This one is for most of the communicators. I did one for the General Church, one for the web heads. This one is for the communicators, the people that run social media, the people that are in charge of promotional stuff. if that is part of your description or maybe that’s what you do as a volunteer basis right now is the time to put together some numbers, some prices, and some costs of what you want to spend on advertising. Justin: Submit your budget proposal for your advertising and promotion like next week. Okay. 10 weeks away. Now’s the time to see, okay, this is how much I want. This is the software I want for a landing page if you need that. This is how much I want for church facebook ads. This is how much I want for professional print jobs. this is how much we need for a radio broadcast. which by the way, a lot of local Christian radio stations, bonus alert. if you are doing a free program at your church, a lot of them will promote you for free. Now if you charge for tickets and stuff, you have to pay them to promote it. But if you’re doing a free church event, a lot of Christian radio stations, will promote you for free. Justin: You just have to give them some time. So go ahead and take a look at that now that you’re 10 weeks out. But get the numbers together that you need for whatever software in advertising, in print costs. Maybe you want to print some extra CDs or some extra gifts because that should be considered with this too. You know, we want to give out Easter mugs or Easter portraits. We need a backdrop and anything that you need to spend money on that actually just be ads, get the costs together now, give it to your pastor by next week because it’s probably going to be three or four weeks before they get an answer back to you. Maybe you have to wait for the financial committee. Maybe you have to wait for the financial planner volunteer to come in once every month to balance the books and Oh, Hey, do we have this amount left over? Justin: It’s going to take some time to get the approval. And again, if you wait till the last minute, they may say there’s no more money for April, right? There’s some more money for the quarter. So go ahead and get your numbers and now and submit them. And then hopefully they’ll come back within 4 weeks and say, yes, you can have this money or worst case. Oh, we got you half of it. Right? So go ahead and start putting those numbers together now and submit them to your pastor or leadership, whoever is in charge of giving you the okay. Dave: Yeah, that’s good. That’s good. And, and while, while they’re working on that, you can be working with the other team to get all the actual artwork done and the proper formatting and all that sort of stuff and formulate the plan that you’re then gonna apply the money too. all right. So back in the sanctuary. Dave: I want to talk about lighting for a second and we’re talking about both the sanctuary lighting, the house lights as well as like the stage lighting and the accent lighting and things like that. Go over all that. Okay. Do an audit on that walk looking up, you know, turn on the lights and then, you know, stand in the balcony or in the back of the room and look where you see a dark panel. You know, if you’ve got like these, these kinds are like single chandelier kind of things with the panels, you know, or if they’re up in the ceiling, walk around and make note of everything supposed to be on. Dave: That one’s not okay. Draw yourself a little grid, little map, whatever. Make note of that. Do the same thing with the lighting. Okay. Blow all that stuff out. Get it all up on the stage and go around and make sure that, you know, everything is the way it’s supposed to be. Make note of all that and then get things replaced. Now again is the time to do that and you need to coordinate this with if you’re in charge of the lighting in this, someone else is in charge of the visual display and the other media and stuff like that. Be sure you’re coordinating with them because if you guys need to rent a scissor lift, you know, if you got a 25 foot ceiling, then you’re either going to like be putting scaffolding in there or you’re going to be renting a lift to come in at…Listen, lifts are 1500, $2,000, you know, to, to rent those things… to come in and especially if they have to be manned. Dave: Okay. Depending on the lift company. So you need to coordinate all this so that once you get up in the ceiling, you’re taking care of everything. At one time, you’re replacing the lamp on the projector, you’re then rolling over. After you’ve dusted the projector, you’re then rolling over and changing a light bulb and then you’re rolling over to the stage area and changing out a couple of the led panels. Or, you know, replacing, you know, Dmx cabling or anything like that. Go ahead and try to get all that stuff taken care of at one time so that it’s a one or two day thing as opposed to, oh, we need a scissor lift. Just drove away and we need to replace these light bulbs. I guess we should have done that at the same time, trust me when your congregation is full of new people or people that are coming back after several years of not being there and they decided, let’s look at this church again. Dave: Now is the time to make sure that they’re not distracted by everything from a panel. Or a light panel that’s out, a dark spot on the stage, a dark spot in the auditorium when the house lights are up or I mean even a ceiling tile that has fallen or that is loose or something like that. Try to get all that stuff taken care of in one, two or three day period when you get a lift. But be prepared and know all these things have to be taken care of this one time. Okay, got to be good stewards. Justin: Chris brought up a really good point. He said, any changes that you want to make to both the stage lighting sound video, you want to give it plenty of time for your teams to adjust to the change. Once you have changed those systems, don’t do it the week before Easter, the week of Easter. Don’t make your run through the actual show, right. Give your team a few weeks to make the mistakes because they will happen. Give your team a few weeks to make those mistakes and figure out where the new knobs, what lights are working. And you know, I remember one time we had a fixed the light up in the ceiling. We had fixed all the lights and we fixed one light and we didn’t even realize that that one light was part of a scene. The baptistry light was programmed with the intimate worship scene and it just never worked. So we never caught it. So we bring the lights down on Sunday morning and there’s just a light shining on an empty baptist. Yeah, it was kind of random. And odd. So you definitely want to have some time to figure that stuff out. Dave: Yeah. That light has been out for six months and you’ve been compensating by picking up the light on the other side of the stage a little bit more or you’ve redirected something. You know, like in our auditorium we’ve got, we’ve got those old dimmer packs and those, those cans stage lights that are like really long throw, you know, we, we go stand on a chair back there and reposition these things. All of a sudden you get three of them fixed and now you’ve got this spot on the stage. It’s like almost on fire because you’ve not compensated for it. So yeah, get all those kinks worked out. Now’s the time. So, I mean like tomorrow morning, Sunday morning, tomorrow evening, you know, you and a couple of guys after work or whatever, go in there and start running through and with your volunteers and stuff and make a note of all this. Dave: And, and by the way, check with your volunteers if you’re in charge of this and you’re not like, like if you’re overseeing several different departments and you’ve got a volunteer who, who knows the sound system or knows the the video system or knows the lighting system… Lean on them. They know what’s broken, they know the nuances and things that, yeah, let’s go ahead and get that fixed. Now they’re, they’re the ones that will bring the wisdom of the specific system and what needs to work and what doesn’t need to be fixed, et cetera. Justin: And let me end on this. Perhaps we should have started with it, but if you hung out till the end, I’m very glad you did. If you’ve listened to this and you say, Justin, Dave these are amazing ideas and yes, you’re absolutely right, but my pastor has not picked a theme. My pastor does not think about Easter. We still haven’t even taking down the Christmas decorations. We still got a wreath hanging up in the sanctuary. So if that’s you, if you’re saying, this all sounds great, but if my church doesn’t work like this, I understand and yes, this is the whole theme of the episode is planning for Easter. Justin: 10 weeks out. If your church is like that, this episode is planning for your Easter 10 weeks and one year out. Okay? If your pastor says, I’m sorry, I don’t have this, I’ll get it to you maybe in March. Okay. What you need to do in a very lovingly non-malicious way is take note of everything that didn’t get fixed by Easter. You say, okay, Easter morning, the projector still doesn’t fit the screen. It is out. We don’t have sermon slides cause he didn’t give me the theme until Thursday or until Good Friday. Right? We don’t have this or this doesn’t work. Or the bulb went out the week before and now we’re scrambling. Anytime that something goes out like that, just take a note. Okay. And then next year you say, pastor, here’s kind of what happened last year and I know you said you weren’t planning on it, but Christmas is over. Justin: It’s January 4th. We need to start planning Easter and here’s everything that went wrong because we didn’t start planning Easter this early. I don’t want that to happen again. I want to create an even better environment than we did last year because be honest, pastors have so much on their mind that stage lighting is not at the top of their list. Okay. They’re more concerned with the couple that’s fighting right now, and at the verge of divorce and rightfully so. So you have to just reinforce it, pastor, I’m here. Here’s what we need, here’s what I know we need and just let me take care of it. But it needs to happen now. and you know, I’d love to run ads. We talked about ads last year. It didn’t happen because I didn’t know what we were doing. You know, we had some scrambling with the audio stuff. Dave: right? And you’ve got a year to start helping your pastor think a little bit more like this or put teams together that can handle these things that really the pastor doesn’t need to be consumed with. So you’ve got some lead time on that. So, yeah. And by the way, we’re here for you. I don’t, I don’t know if you realize this or not, but you do not have to do this alone. My mom and dad go to a church with about a hundred and 50 a given Sunday, three staff positions. One of them is part time and you know, I mean, very small church. I want my mom to know that she’s not alone. When it comes time to, you know, bulletin designs and art work to promote a event or something like that. Dave: She’s not alone. You’re not alone. Okay. Your staff is not alone. If you’re a pastor of a church plant and it’s you and your wife or your husband, you’re not alone. Church Training Academy is here for you. 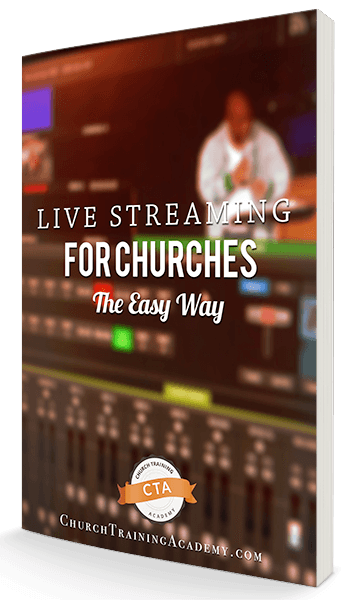 If you go to churchtrainingacademy.com/join, you can at the time of this recording and maybe if you’re watching this because it’s coming out like this week in a couple of days, you may get in under the line, you can still get in for a very affordable monthly price to become a CTA insider and have access to all kinds of training and tutorials and tips and a community of people that are here to help you. Some people have done stuff that you’re wanting to do and they can share that information. Some people have ideas that they want to know if it’s gonna work or not and you’ve already done this or you’ve come up with a way to do it in a much more cost effective way. Dave: That’s what our community is, what CTA insiders is for. And one of the biggest benefits of being in an insider besides the training courses that we have, besides the tutorials besides the private facebook group where basically we can all just ask each other questions stuff we have twice a month, we do a live mastermind group coaching where all the members that are available for that two hour time period on Thursday night come together and bring whatever the situation is, whatever you’re going through. Chris, Christopher Hall out in, Reno he’s out there and he was putting together a little studio because they’re going to do a, like a little q and a type to show that they’re doing. Dave: He and his pastor. And so he was putting it together and he was showing it to us in the last one and we were helping them tweak, right then, you know, hey do this, do this, hey adjust this light, here’s how you can take care of that backdrop. Stuff like that. Fixing whatever the problem is or whatever needs to be tweaking, doing it live like right then and there. Like all together and everybody gets to chime in and share their knowledge and their resources stuff. It’s absolutely wonderful. Would you say that becoming a CTA insider is worth it, justin? Justin: Yeah, it’s absolutely worth it. And again, I know people tell us…I asked our email list, hey, how come you haven’t joined CTA insiders yet? And everything I got was my church can’t afford it. I’m at a small church, my church can’t afford it. I can’t even get $5 to take someone out to starbucks. Okay, fine. I get it. We did a poll in our CTA insiders and over half of them pay for it out of their own pocket. Okay. And right. And if that’s going to be you right now’s the time to join because it’s only $27 a month. If you’re listening to this with nine weeks to Easter left, it’s too late. The price has gone up. It’s still $37 a month. Other people in our space charge $500 a month. Yes. $37 a month is nothing compared to those guys. Justin: And we’re going to go along with you and it’s just considered a gift of the church. considered a gift to yourself. And then time savings. Just to let you know what we talked about last night. Last night we had our mastermind and we came out with eight lessons learned. First we talked about getting started, podcasting, defeating the nerves of starting. if you are starting a podcast, maybe you are just starting to put your sermon out there. You get nervous, we talked about that. We talked about instagram stories and how to get more engagement. We talked about eSports ministry, live streaming, twitch and what exactly should we do about that? Chris gave us a podcast studio tour. One of the favorite things we talked about last night was the lowdown on instagram follower accounts. Justin: We talked about, you know, growing your instagram page and what follower count really matters. And it’s not just about your follower account and it’s not about who’s following you. It’s about the social proof that they provide. So we’ve talked about that. My favorite thing of the night, it was the last thing we talked about tips for making logos faster, especially when you have nothing to go on. You ever had someone come up to you and say, Hey, I need a logo by tomorrow. What do you want it to be? And they say, oh no, you make it look good. You don’t have much to go on. You’ve got to make it fast. And then of course, you know, you make something and they say, oh, that’s not really what I had in mind. Hey you can make it again please. I don’t why I did a face there. Justin: We talked about that. Making it a logo as faster. and then we talked, we helped Tommy troubleshoot his computer. And the last thing was talked about youtube and facebook watch times. We kind of demystified that. and you know, what’s a good watch time. I think we all learned something there. So that was, that was a good one. That’s what we talked about last night. If any of that stuff interests you or if you’re like, man, I had that question. First of all, when you join those videos go up. Those are going up. I edited to them last night. Right. Those are going up today so he can go back and watch those previous clips or archiving all these in there. Dave: Yeah. Big searchable knowledge base is basically, I mean to ask a question or put in a keyword and we will have or very soon be covering that topic. I’m really surprised. And of course if there’s anything missing, you bring it, you’re never more than three weeks away from having the next mastermind and be able to bring it. And if that’s even too far away, you have the facebook group, right? You post a video, you do a studio tour. You say, this is the issue. Share your screen. Justin: I charge, I charge $80 an hour for computer troubleshooting. You can pay less than half that and have dozens of people helping you with your, with your issues. I don’t know. To me it’s a no brainer.